The world of dog shows can be an exciting one, with the opportunity to see beautiful examples of many different breeds. It is also a great way for you to meet other people who have similar interests to you. The aim of dog shows is to evaluate individual dogs and acknowledge those that are closest to the breed standard. The standard spells out what would be considered the ideal dog - it describes their size, shape, coat type and color, as well as how they move. Given that the whole point of breeding dogs is to produce puppies that are better than their parents, dog shows allow breeders to choose the best dogs to be mated. This increases the chance of their puppies having the best characteristics and temperaments. - An all-breed show has competitions for over 150 species of dogs that are recognized by the AKC. - Specialty shows are restricted to either one certain breed or varieties of that breed. - Group shows are just for dogs that belong to one of seven groups, such as the Hound group. To show a dog, he must be a pedigreed dog and individually registered with the American Kennel Club. He should meet the breed’s standards, and the closer he is, the more likely he is to win a ribbon. During a show, the judge will examine all of the dogs individually while standing still and then while trotting around the ring. They will then run their hands over the dogs and examine them more closely. They will then give awards to those that in their opinion are closest to the ideal dog, as described in the standard. 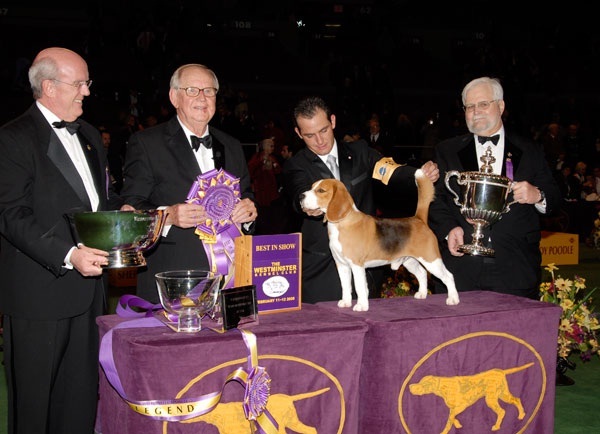 The judges must be extremely experienced in the breeds they are qualified to judge, and most of them have bred and shown dogs for many years. Some larger shows invite judges from overseas to officiate at their events. This usually attracts more entries from breeders who are keen to see how their dogs shape up in the eyes of someone from another country. If this sounds like something you’d like to try, it’s a good idea to go to a few shows first, just to better understand the way they work. Then you should join a kennel club, whether it is a breed specific one or a general one. They will have information on how to show as well as training classes for the show ring, and teach you how to best present your dog for judging. If you do not want to take your dog in the show ring yourself, you can ask an experienced friend to do it. Professional handlers are also available for hire. These people are very experienced and will present your dog beautifully. You may find that as you watch your dog in the ring, you’d like to show him yourself. Not all people who show dogs want to breed them; some just want to get out and share a fun activity with their dog. Showing a dog is definitely that: a fun activity that will allow you and your dog to make new friends and have a good time. Being a veterinarian is her career, freelance writing is her hobby. Find advice from Susan Wright, on selecting the best breed of dog for your personal living condition.